Okay, maybe it’s not 101 food photography tips quite yet, but I’m working on it! Quite a few years ago, I started writing articles, as Food Photography Tips, trying to share what I’ve learned over all these years photographing food. I’m not really sure why I started doing this, I just sort of enjoy it, I guess. Maybe it makes me feel like a big shot, maybe it’s partly the SEO benefits I derive from posting articles about food photography on my website. Maybe it’s a bit of both. Probably another reason is because all I see out there on the net about food photography, is either REALLY basic stuff, or total BS… I’ve been in the trenches of food photography and I think that I can bring a unique, interesting, and informative bunch of food photography tips to everyone out there with enough time and interest to read and listen to what I say here. * I’m will be updating these articles and moving them from my old site to the newer designed webpage. Any article with a * will indicate that it is still housed on the old site. My Food Photography Blog – A running list of all my blog posts about food photography, some of which end up being listed on this page. 101 Best Food Photographers – A collection of links to the best food photographers in the world. I personally use this for inspiration. * The Perfect Digital Food Photography Lens I found a new DSLR food photography lens that I just love! * What’s the best lens for food photography? * Bigger is not always better? 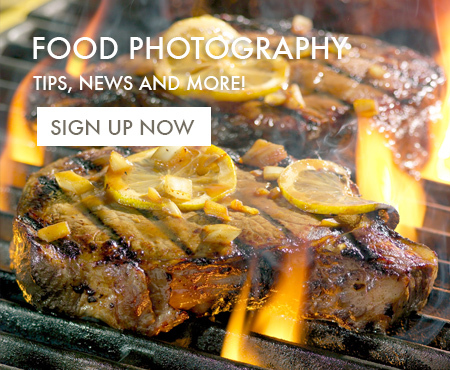 * Digital Food Photography Tips (page #1) Tips on digital food photography for the novice food photographer. * Digital Food Photography Tips (page 2) Tips on digital food photography for the novice food photographer. * Marketing concepts for the commercial photographer. * What makes a food photo look natural?